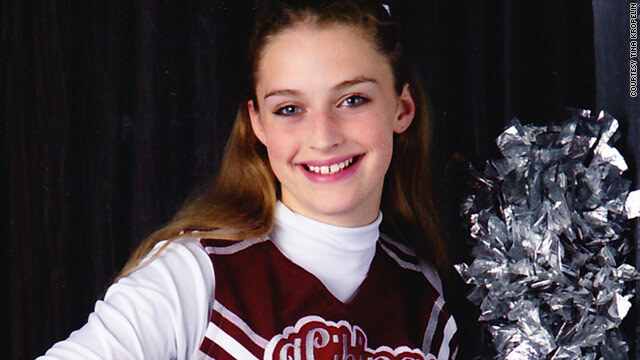 Brittany Noffke was 14 when she fractured her skull in a cheerleading fall. It took years for her and her family to recover. Researcher: "We know how to prevent all this stuff. We need to have higher standards." (CNN) -- The voice on the phone sounded calm to Tina Kropelin. It said her daughter had just taken a spill at cheerleading practice, and she should come get her. As Kropelin headed to Holmen High School in western Wisconsin, she worried it might be a broken wrist or a sprained ankle. Her daughter, Brittany Noffke, was a freshman and already a varsity cheerleader, a "flyer" who hit the dramatic height of stunts with a smile on her face. Crutches would make her crazy, Kropelin thought. She found Brittany with an ice pack to her head. She had fallen off a teammate's shoulders, and her head had smashed into the tile floor of the school cafeteria. Conscious but confused, Brittany said she and two other cheerleaders had attempted a stunt their coach suggested, one they'd never tried together. The last thing Brittany remembered was making it to the top and telling herself to stay still. Her teammates had to fill in the rest: While Brittany teetered some 5 feet above ground, the spotter went the wrong direction. She fell backward with nobody to catch her. Even the cheerleader holding her didn't realize what was happening until Brittany's head hit the ground. Brittany had seen the blood coming from her head. The 14-year-old told her mom that her ears felt plugged and there was a crackling sensation in her skull. Until that moment in December 2004, "I never much thought of cheerleaders as athletes," Kropelin said. "I didn't realize the risk that these athletes face." Kropelin also didn't realize how Brittany's injuries -- a fractured skull, concussion and bruising on the brain --would rock her family emotionally and financially. Brittany's physical symptoms mostly subsided after a few months, but the injury rippled through their household for years. I never much thought of cheerleaders as athletes. I didn't realize the risk that these athletes face. It led to long-lasting anxiety and depression, a lost job, a move to another town and mountains of medical bills that contributed to bankruptcy. "It affected so many facets (of our lives)," Kropelin said. "It just kept going." The severity and frequency of injuries across youth sports has drawn major headlines and deeper research during the past few years, and the onslaught of new information could revolutionize prevention and treatment for youth sports injuries. In the years since Brittany's injury, doctors and researchers say, medical information in schools has improved dramatically. But parents are sometimes the least informed about what injuries their kids might face, and many are unprepared to guide their recovery. The next great challenge for doctors: Implementing consistent health messages in all sports programs and schools -- and homes, too. "If you think about decades ago, it was a ding. 'You had your bell rung, get back in there, tough it out,' " said Julie Gilchrist, a pediatrician and epidemiologist with the Centers for Disease Control and Prevention's injury prevention division. "Kids need to be active, and they need to be having fun, but don't take injury prevention for granted. We need educated health consumers." In 2001, Eddie Canales watched his son Chris lay on a football field, immobilized with a spinal cord injury. The family was overwhelmed by Chris' physical recovery -- he now uses a wheelchair -- as well as his psychological recovery. About a year later, the father and son witnessed a similarly catastrophic injury during a high school football game. They had a rare perspective on what the player's family would need in the coming months, whether it was money for household supplies or the comforting words of someone who had survived the ordeal. They reached out to the family and saw that if they could help one athlete, maybe they could help more. 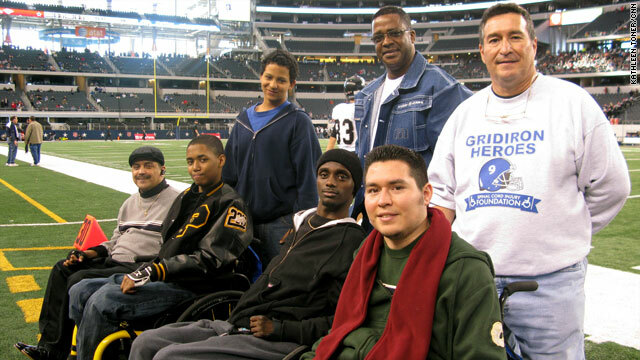 Within months, Eddie Canales founded a nonprofit, Gridiron Heroes, which aids other Texas athletes who experienced spinal cord injuries while playing high school football. "We try to provide information, inspiration and hope," Eddie Canales, one of the Top 10 CNN Heroes of 2011, said earlier this year. "We want to make sure they don't feel alone. "Someone injured on a professional level is going to be taken care of. But on a high school level, it's a totally different story." Parents, even those who are well-informed, never expect their children to be seriously injured while playing sports, said Greg Chertok, a sports psychology consultant in Englewood, New Jersey. If it happens, they'll get information about how to care for their child physically; resources about managing concussion symptoms or rehabbing ligament tears have only gotten better in recent years. But it's still rare to receive instructions on mental health for children and their family members, Chertok said. "This is something completely unexpected, and it changes the social fabric of the family," Chertok said. "A high school student's brain is a little less mature, so their coping strategies won't be as developed. I would say parents are ill-equipped. It's not in their scope. It's not even on the radar." At the hospital on the night of Brittany's fall, the young athlete was dazed but her mother was angry. Kropelin couldn't understand why the team was trying new stunts on a hard surface, why nobody seemed prepared for an emergency and why nobody called 911. "I was in shock," Kropelin said. "I'm thinking 'Oh my God, is she going to be paralyzed? Is she going to have brain damage? Is she going to be the same child she was?' "
As the weeks went on, the questions and stressors piled on. Brittany experienced headaches, dizziness and vomiting. The fall robbed Brittany of her sense of smell; she could hardly taste food, and her weight plummeted. "By the end of Christmas break, I was like, 'Can we just go back to normal? I just want to go back to school,' " said Brittany, now 21. But even school wasn't the same. Her doctors told her not to cheer, stunt or tumble. She wasn't allowed to participate in gym class because of concerns about a second concussion. Without the social connections she'd made through cheerleading, Brittany sank into depression. Doctors said mood swings were likely tied to the brain injury, too. "She would have such violent outbursts of anger. It was so uncharacteristic," Kropelin said. "She was not my Brittany." The accident turned Kropelin into a "nervous mom," she said, one who didn't want her daughter to go out, stay up late or move too fast. With all the attention on Brittany at home, Kropelin said her 7-year-old son felt ignored. The stress and time off work cost Kropelin her job, and it took about six months until she worked again. Meanwhile, medical bills and other expenses piled up, and the family filed for bankruptcy in 2005. "It was a totally difficult time," Kropelin said. 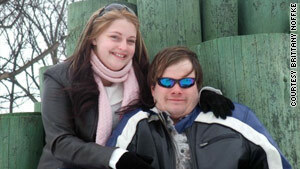 Brittany Noffke, pictured today with her boyfriend, David, wants better safety standards for young athletes. The family filed a lawsuit blaming the school and the cheerleader who failed to spot Brittany during the fall. Kropelin and Brittany said they wanted the lawsuit to force the school to take responsibility, improve safety features and follow athletic emergency plans. Some in the community believed the family was trying to make money off the accident. Brittany felt ostracized -- she became known as "the girl who sued the school" -- and she felt guilty. After the fall, Holmen banned cheerleading stunts. "Cheerleading was no longer as fun an activity to be a part of," said Brittany, now a certified nursing assistant and a safety ambassador for the National Cheer Safety Foundation. "I didn't want to take cheerleading or stunting away from anybody, but a lot of other students blamed me." The family moved across the state and changed school districts for a while. It seemed like a way to get a fresh start. In her new school, Brittany was on the honor roll and got involved with cheerleading again. But family and familiarity drew them back to Holmen about a year later. As much as the family wanted to forget what had happened, Kropelin said, "you can't wipe away emotions by moving." Brittany was already in college in Minnesota when the Wisconsin Supreme Court made its decision in 2009: Neither the school nor her teammate were at fault for her injuries. Cheerleading, the court ruled, isn't so different from football or hockey -- they're all contact sports, and sometimes, athletes get hurt. For decades, decisions about high school athletics were based on what was known about college or pro athletes. There wasn't much appreciation for how younger athletes bodies were changing, how their brains were developing or how their skills weren't as polished. And with 7 million high school students playing sports governed by different rules, coached by people with different backgrounds and counseled by trainers with different response plans, there were few straight answers for how to handle injuries -- or prevent them. Now, "a number of us believe sports can be everything it was intended to be," said Michael Bergeron, a fellow with the American College of Sports Medicine. They're relying on research like the National High School Sports-Related Injury Surveillance Study, which is in its seventh year and has grown to include 20 sports, from basketball to gymnastics. They're pushing athletic programs away from a "rub some dirt on it" philosophy and expecting everyone around young athletes to monitor their health. The CDC developed its "Heads Up" initiative, which trains coaches to prevent, recognize and respond to concussions. They adapted the curriculum to fit on a locker room poster or the back of clipboard, then created resources for parents, doctors and classroom teachers. Even if a kid shakes off a hit during Friday's game, Monday's class work might be the trigger that reveals a bigger problem. Lawmakers announced last week that the CDC will create national guidelines for preventing and managing sports-related traumatic brain injuries. The guidelines will be created by a panel of experts, and they are expected to be finalized by 2013. And last month, the American College of Sports Medicine co-launched the National Youth Sports Health and Safety Institute. Bergeron, its executive director, said it will develop, share and advocate for national recommendations and research that make youth sports safer. Its first targets: brain injuries, heat illnesses, overuse injuries and clinical conditions such as eating disorders and sickle cell trait. "We know how to prevent all this stuff. It's just a matter of everyone speaking with one voice. We need to expect more. We need to have higher standards," Bergeron said. "Something needs to change." It might be the gear, the rules of the game, how kids practice, how coaches are certified, how parents are prepped. It certainly means doing more research and finding better data to drive decisions. Many schools, including Brittany's high school in Wisconsin, now tests some student-athletes' typical neurocognitive responses before injuries so trainers can make better judgments after an injury. But the expectations placed on young athletes might change, too, researchers said. "The classic coaching mantras -- 110% all the time, every day -- you can't do that. That's a risky situation for kids," said Diane Wiese-Bjornstal, an associate professor in the University of Minnesota School of Kinesiology who appears in the documentary "Concussions and Female Athletes." "Those that are fatigued and under a lot of stress are more likely to be injured. There are things we should be doing as educators that could make a difference." Brittany Noffke cheered for Minnesota State University Moorhead, and is now certified as a nursing assistant. Nobody, Wiese-Bjornstal said, wants parents to pull their kids from sports out of fear. 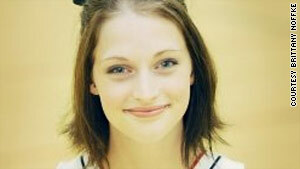 In her freshman year of college at Minnesota State University Moorhead, Brittany again tried out for cheerleading. Her mother said she was proud of her daughter but knew she could never watch her cheer. "Too nervous," Kropelin said. But once again, Brittany was a flyer. The first few stunts were scary, but Brittany said she had stopped thinking in "what ifs" long before. The university seemed prepared for an emergency, and the coaches paid close attention to safety. Even after the fall and all the trouble it caused, she never could shake her love for cheering. "I wanted to conquer that fear," Brittany said. "It is amazing. We're up in front of the crowd, everybody's cheering. I just love the feeling -- the stunt that went perfectly."